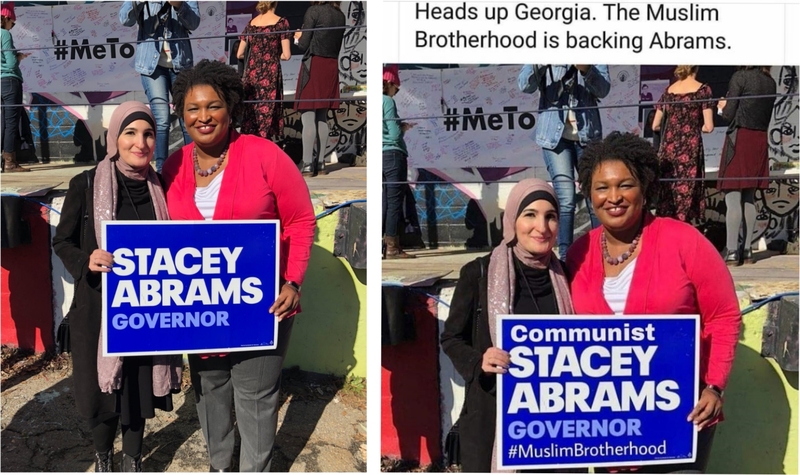 A doctored image of Stacey Abrams shows the Democratic candidate for governor in Georgia holding a sign that labels herself a “Communist” and includes the hashtag “#MuslimBrotherhood.” Abrams is seen standing next to political activist Linda Sarsour, who wears a hijab. There’s no evidence to support that claim, spread on Facebook with the help of more than 18,000 people who shared the manipulated photo. The actual image, posted on Abrams’ Twitter account, was taken at a January rally in Atlanta that marked the anniversary of the 2017 Women’s March. Sarsour, a Palestinian-American Muslim, sits on the board of the Women’s March organization. Left: Original image shared by Stacey Abrams in January 2017. Right: Manipulated image shared on social media. References to the Muslim Brotherhood — an influential political Islamist group that was started in 1928 — have been employed repeatedly in political ads and false stories. While the organization itself officially renounced violence decades ago, Muslim Brotherhood offshoots include the terrorist group Hamas. Several countries have labeled the Brotherhood a terrorist organization, a designation that the U.S. has in the past considered, but that some experts say is unjustified. Conservatives have used comments by Sarsour — including an approving tweet about the Muslim Brotherhood in Egypt — to criticize the activist. Regardless, we could find nothing to support the claim that the organization is “backing” Abrams, who is the daughter of United Methodist ministers and belongs to the Columbia Drive United Methodist Church. Commenters on the altered image nevertheless conveyed a sense of agreement — either believing the image, or the message it represented. Baker, Peter. “White House Weighs Terrorist Designation for Muslim Brotherhood.” The New York Times. 7 Feb 2017. Country Reports on Terrorism 2017 – Foreign Terrorist Organizations. U.S. Department of State. 2017. Gilbert, Kathy L. “Georgia candidate has deep United Methodist roots.” United Methodist News Service. 25 Jun 2018. “Meet Stacey.” StaceyAbrams.com. Accessed 8 Oct 2018. “What is the Muslim Brotherhood?” Al Jazeera. 18 Jun 2017. "Heads up Georgia. 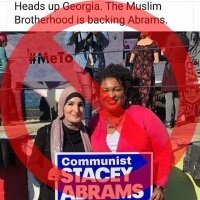 The Muslim Brotherhood is backing Abrams."